Luma (also referred to as Apricot Luma, Baby Luma, Little Luma or young master Luma) is a major character in the games Super Mario Galaxy and Super Mario Galaxy 2. Like many Mario characters, he is named after his species. As chronicled in Rosalina's Storybook, Luma was first met by a young Rosalina near a rusted spaceship; he explained to her that he was awaiting his mother, who was coming for him on a comet. Rosalina promised to wait with him, and the two eventually repaired the spaceship with the intent of using it to search for her themselves. As the pair travelled through the cosmos, they came across a comet made of ice and, though there was no sign of Luma's mother, decided to remain on it as they continued their search. One night, after dreaming of her own mother leaving her, Rosalina took Luma in her arms and adopted him as her own, promising to take care of him herself from then on. Using materials they found frozen beneath the comet's ice, Rosalina and Luma constructed a house for themselves. Following the arrival of more of his kind from a nearby planet, Luma began to fight with them over Rosalina, who proceeded to welcome them into her new home and give names to them all. Some time later, when reminded of her former home and family, Rosalina became saddened once more - to cheer her up, Luma reminded her that her mother would always be a part of her and transformed into the Beacon, so that she would have a way of visiting her home planet every 100 years. Peach holding Luma in Super Mario Galaxy. Many centuries later, Bowser attacks the observatory and steals the Grand Stars it requires to function - it is presumed that during the confrontation, the reborn Luma was knocked from his home and fell to the Mushroom Kingdom below. Luma is then found by Princess Peach, who invites Mario to her castle during the Star Festival to show him her discovery. After Mario is sent flying off into the cosmos by Kamek's attack, Peach sends Luma after him as her castle is towed away by Bowser's forces to the center of the universe. Luma is formally introduced to Mario when he awakens on a planet within the Gateway Galaxy - after giving him a brief tutorial and a game of hide-and-seek, the star child determines Mario may be capable of helping Rosalina and joins him at his mother's request, taking up residence beneath the Mario Cap and in the process granting him the Spin maneuver. Together, the two make their way through numerous galaxies and slowly reclaim the lost Power Stars, eventually returning enough power to the observatory's Beacon to allow themselves access to Bowser's Galaxy Reactor, where Mario uses Luma's powers to defeat the Koopa King once and for all. Following Bowser's defeat and the rescue of the final Grand Star, the star it had already begun to form implodes on itself due to a lack of power - the ensuing black hole begins to rapidly consume the entire universe. Luma then appears from the Mario Cap and, after a wave goodbye, flings himself into the heart of the catastrophe, and is followed by the other Lumas. Their efforts succeed in stabilizing the black hole, destroying it and restoring the cosmos to their former state. After the player collects all 120 Power Stars and defeats the final boss once more, a secret ending is displayed, in which Rosalina is shown thanking the player and promising to watch over them from beyond the stars before departing from the Gateway Galaxy in the observatory. The scene then shifts to the dilapidated spaceship from her storybook, with Luma peering out from inside; he waves once more at the camera before rising up toward the stars and out of sight. Mario finds the lost Baby Luma in Super Mario Galaxy 2. Luma makes his second appearance in Super Mario Galaxy 2, where he is called Baby Luma. He is found in the Prologue of the game lying on the ground and immediately takes a shine to Mario. Baby Luma flies into the Mario Cap and Mario's body begins to tingle, giving him the power to spin. Mario later meets two other yellow Lumas which call Baby Luma "young master Luma" and send Mario off to the Sky Station Galaxy. Baby Luma is later reunited with Lubba who thanks Mario for saving him and together, Mario and Baby Luma travel through many new galaxies to defeat Bowser once again. Baby Luma in the game's ending. After Bowser is defeated, Mario returns to Starship Mario with Princess Peach and the Grand Star, after which Rosalina appears in her Comet Observatory. She explains to Mario that she knew all along that she would someday be reunited with the Baby Luma, because there is a power even beyond that of the stars that governs the destiny of them all. After promising that he'll never ever forget about Mario and taking the Mario Cap as a souvenir, the Baby Luma rejoins Rosalina and leaves with her. Page 66, where Luma first appears. He introduces himself and wants to play with Mario. Mario is reminded by cookies by Luma's appearance, and does not want to play with Luma and would rather play his Nintendo DS, much to Luma's irritation. Mario does not want to do anything. 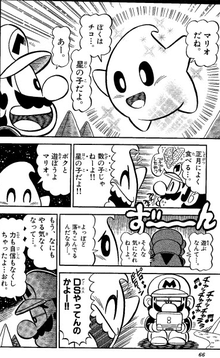 Luma, alongside other Lumas, appears in Super Mario-Kun volume 38 after Mario lands on a planet after he is swatted away by Bowser. He wants to play with Mario, but Mario does not want to do anything, after Mario loses his confidence. Just after Luma tries to encourage Mario to get up and save Peach, a giant Goomba comes. Luma wants Mario's help, though Mario refuses. Rosalina pops up and encourages Mario to fight the Goomba. Mario then learns the Star Spin technique and defeats the Goomba, who turns out to be just an illusion created by Rosalina to help Mario regain his confidence. They team up and help each other as the adventure progresses. In this adaption, Luma calls himself "A Star Child". He is also given a mouth, mostly to illustrate facial expressions better. The cover also depicts Luma as a yellow Luma instead of a cream-colored one. Luma appears in Mario Golf: World Tour, making a cameo in Rosalina's best post-hole animations. He is seen wearing Mario's cap like he does in the ending of Super Mario Galaxy 2. In Super Smash Bros. for Nintendo 3DS / Wii U and Super Smash Bros. Ultimate, Rosalina and Luma are playable characters, and their skin coloration can be changed. An alternate skin for the Luma is colored after the Baby Luma. This character is also present in the form of a trophy in Super Smash Bros. for Wii U. Due to Mario Sports Superstars reusing Rosalina's golf animations from Mario Golf: World Tour, Luma reappears in this game in the same capacity. Luma during Bowser's kidnapping of Princess Peach. Luma being held as Peach calls out to Mario. Luma taps on Mario's nose in an attempt to wake him up after his knockout. Mario and Luma first meet. Baby Luma in the Library. Luma, appearing in Mario Golf: World Tour. Trading card description: There are no other Lumas in the Galaxy that are like the very special Apricot Luma. This is the Luma that Rosalina gives to Mario in the beginning of the game, who grants Mario the power to do star spins -- a move that will be invaluable against many unforeseen enemies. Prima Games Official Guide bio: There are many Luma[sic] in the cosmos, but this particular Luma is Mario's constant companion during his space travels. This cute little star gifts Mario with some amazing skills, such as the ability to survive in deep space and unleash a special spin that helps him break free of gravity and damages various dangerous denizens. While Mario explores the galaxies, he will meet many different Luma,[sic] from helpful black Luma[sic] that manage the charts of the cosmos to green Luma[sic] that hide a special secret. "Mario found this lost little Luma. He grants Mario a mysterious power of the stars, which comes in handy as they explore the cosmos together!" Wii Super Mario Galaxy 2 11/2007 Once every hundred years, stardust will rain down upon the land. Of course, this is a perfect time for Peach to get kidnapped. In order to save her, Mario sets off across the galaxies with the aid of a lost, little star child. 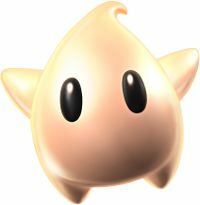 Named Little Luma, this star child uses its star powers to help Mario. Once every hundred years, shining stardust falls on the Mushroom Kingdom. Surprisingly enough, this time it leads to Peach being kidnapped AGAIN! To rescue her, Mario embarks on a journey across the galaxies with this lost little star child who uses his mysterious star power to help Mario, all while looking incredibly adorable! Bebīchiko Chiko, as called in Rosalina's Storybook. Petite Luma (Super Mario Galaxy 2 manual) From the Japanese name of the Lumas. Luma's coloration is very similar to the color "Cosmic Latte", which astronomers determined to be the average color of the universe. If Mario replays the "Grand Star Rescue" mission of Gateway Galaxy, there will appear to be two Lumas, one that helps him spin (an ability he is supposed to get later in the mission), and one that Mario chases as a Star Bunny. ↑ Super Mario Galaxy trading card. ↑ Super Mario Galaxy 2 English manual, page 4. ↑ Super Mario Galaxy Nvidia Shield screenshot thread. Twitter. Retrieved March 27, 2018. This page was last edited on February 11, 2019, at 04:23.